On June 12, I had the pleasure of participating in a photo shoot on the occasion of Randall and Alean Andrae's 63rd wedding anniversary. Cars have always been a major part of the Andrae’s lives, consequently, it was only appropriate that they capture their wedding anniversary by having a professional photographer take photos in their front yard with two special cars, a 1959 Rolls-Royce Silver Cloud and a 1925 Rolls-Royce Silver Ghost. The Cloud is actually Randall’s most recent acquisition. When Clouds came out the Andrae’s had two as their daily drivers. According to Randall they were extremely reliable. Randall purchased the Cloud in the photo a couple of years ago in Chicago. It presumably had been an embassy car, and has only 23,000 miles showing on the odometer, however, the mechanics did not come up to Randall’s standards. He discovered the car had previously overheated damaging the valve seats. The repairs had not been done properly. Randall was able to find some new old stock heads and the engine now performs as new. Among other things he also installed a modern air conditioning system and a state of the art stereo system. The Ghost, on the other hand, is an old friend that returned for the anniversary. The Andrae’s bought the car in the 70s when they lived in California. The car was original with only 24,000 miles. Randall went completely through the mechanics of the car and made discrete modifications such as adding an overdrive, switching the electrical system from six volts (unique to U.S. built Springfield cars) to twelve putting in electronic ignition, and rebuilding the engine with lightweight modern performance components. 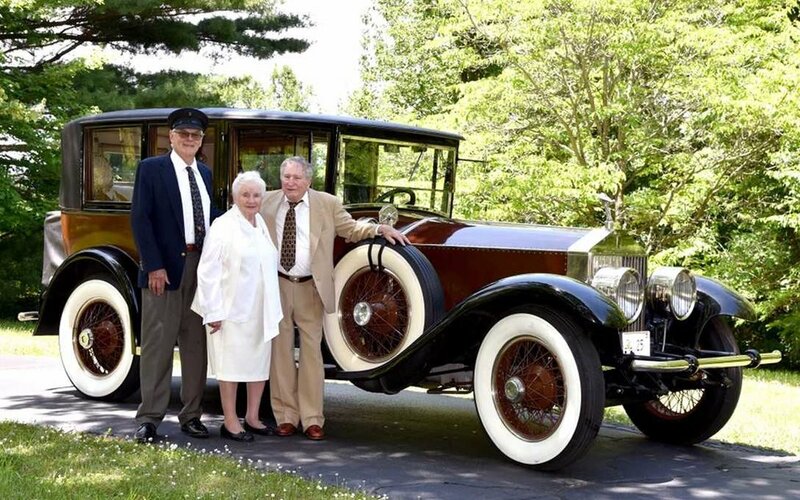 The Andrae’s have driven the Ghost over 50,000 miles including coast-to-coast Rolls- Royce Owner's Club, Silver Ghost Society tours and CCCA CARavans. I didn’t think the Andrae’s would ever sell the Ghost. They knew I had always wanted to acquire a Ghost and late last year I was fortunate to be entrusted as the new owner. It was only fitting that I appear with the Ghost and serve in the chauffeur role for the Andrae’s monumental occasion. Photos by Fricke Studios, Washington, Missouri.